We have all been in the situation where you were just involved in a fender bender, or slid on black ice into the bank of snow, or the unforeseen break down on the highway on the way home from work that had left you in the middle of nowhere. ​ We have all found ourselves in one of these situations at one time. From car trouble to someone rear ending you all the situations has one thing in common. They all require a tow truck company as a result. When the time comes that you find yourself needing a tow truck the next call that you make could mean a world of difference in the outcome of your story. You want to make sure that the tow truck is a reliable professional company that can get you going as soon as possible. Buzz Towing is a reliable company that offers a variety of services to meet your needs. A company that offers 7 days a week service is one of the most important aspects. The next is making sure that the company has the equipment to service your needs. ​ If you need tow service even in weekends or holidays most of the towing companies are closed, but not us! We are open every day of the week from 6 am to 11:30 pm. Our company offers 7 days tow service for all your unforeseen emergencies and roadside service needs. Emergency towing is a service that we offer and take seriously. When a call is placed with us for an emergency tow we are on the top of our game with great customer service and quick response times. 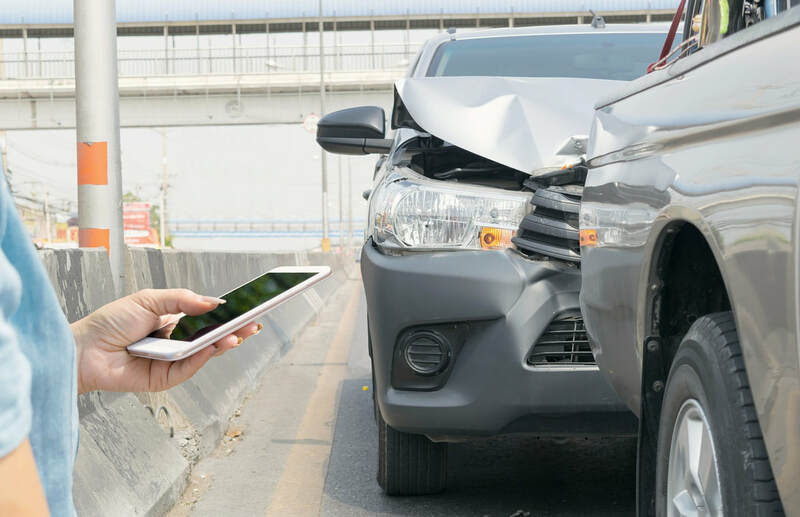 During those times no one wants to add stress to an already bad situation.When you are involved in an accident or your vehicle breaks down, contact us. 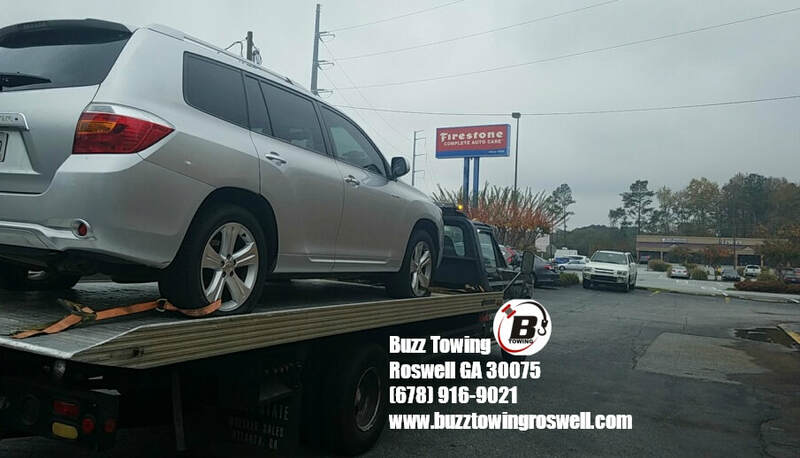 Your car will be towed successfully to the repair shop of your choice or to your home by some of the most experienced drivers in the industry from Roswell and surrounding area. ​ ​Buzz Towing’s emergency tow service is available 7 days a week and we can tow your vehicle out of the worst of situations. ​​ Problems with you motorcycle? Was it stalled, broken down or laid down and not coming back up? If your answer is yes, you need a tow company like Buzz Towing from Roswell GA to help, because you need someone with experience, the right equipment and tools to handle this situation in an effective, safe and efficient way. We offer 7 days a week, even weekend towing and holidays. If you need immediate roadside towing truck service or even emergency towing services for your motorcycle call us today at (678)916-9021 Our drivers have expertise to handle the job. ​​ The standard def of a local tow in the industry is any job done under 25 miles is called a local towing job. We need to mention here that our local tow service is cheaper than any long distance service. 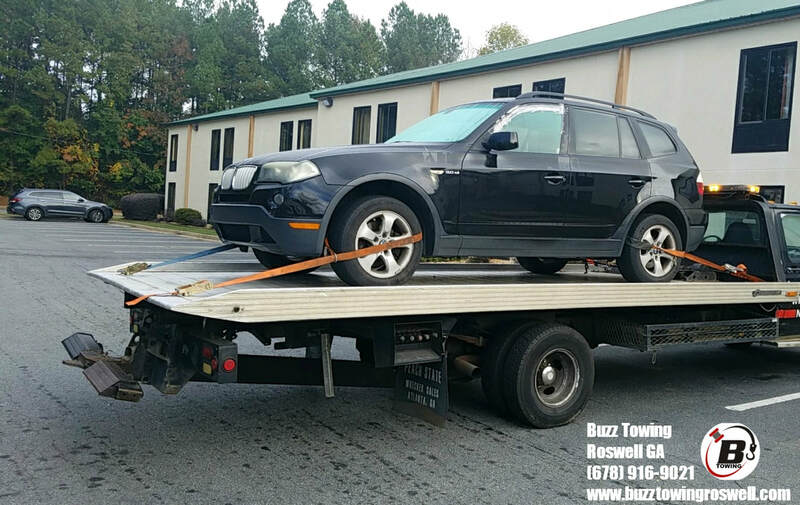 ​ Buzz Towing is an affordable towing company and we offer an awesome customer service. No added fees here. No small wording on the invoice. What we quote when you call us is what you will pay at the end of our work when your tow job is done. Call us at (678) 916-9021 and we will show you the best customer service in Roswell GA. When customers call for local towing service is it because they have broken down and need the fastest response. We always dispatch the driver that has his location as close as it can to our customer so he can get right to work. Our goal is to get to each of our customer in less than 30 minutes of time we accepted the towing job. Our team is trained in luxury car transportation. We have the knowledge and equipment to handle your luxury car to ensure it will not be damaged along the way. We are ready for towing almost every type of auto vehicle, including luxury vehicles, small and medium size trucks, sport cars, classic cars and exotic cars. ​ We are available 7 days a week for your convenience and ready to serve you on short notice. We offer our tow services in any city and neighborhood within a 20 mile radius of Roswell GA. Just tell us where your car needs to go and we are happy to tow your car to the destination of your choice. 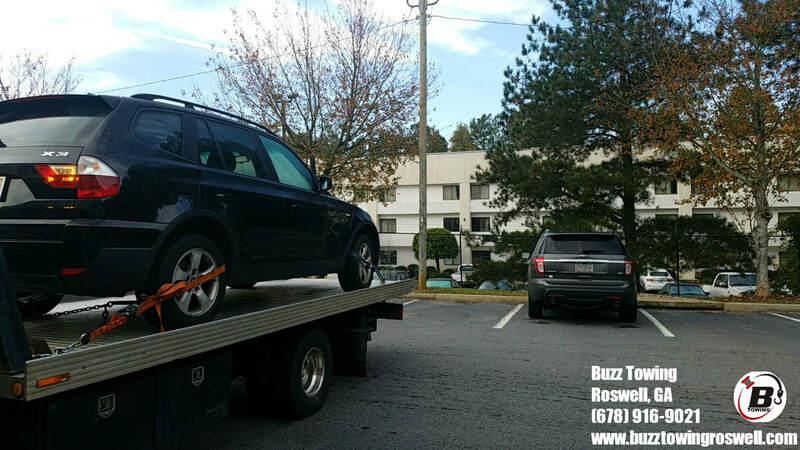 ​​ Buzz Towing offers affordable, safe long distance towing service. ​ It's stressful situation being stranded on the side of the road. That's why Buzz Towing is always ready to help when you're on the side of the road and need a long-distance towing. When you need your car transported from one location from one city to another and the distance is more than 25 miles than you can rely on our long distance towing service. Call us and let us help you plan the safest transportation of your vehicle to the place you need. Using a long distance towing service even if your car doesn’t have any problems helps you avoid additional wear, tear and extra mileage you put on your vehicle. So planning to move in another city and want to get rid of another worry of moving your vehicle in a safe way to your new address without damage call us for a quote for a long distance. ​​Having trouble with your all-wheel drive vehicle? Are you in need of towing truck services? No problem! We can help. 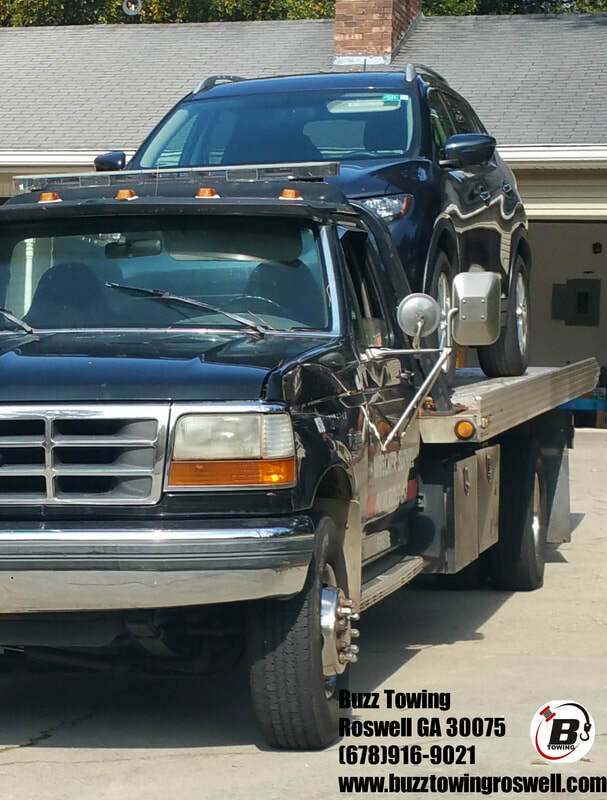 Call Buzz Towing company at (678)916-9021 . We serve the city of Roswell and all the surrounding areas. Call now and we will be there in less than 30 minutes. We can tow your 4 Wheel Drive or All Wheel Drive vehicle anywhere in Roswell GA and surrounding areas and you can rely on us to provide reliable, safe, efficient and affordable tow services. You are already stress because of the situation you are in, don't make it worse by calling for a Roswell Towing Company that won't provide outstanding customer service. Check their reviews on Google. We have a great reputation for taking great care of our customers. Don't trust your 4 Wheel Drive or All Wheel Drive vehicle to any tow service. Call the Buzz Towing, a great towing and roadside service company you can trust. Car transportation is also a service that our drivers are trained to handle. When you need a non-damage or disabled vehicle transported from one location to the next. We are your team. ​We hopefully answered to most of your towing service questions. If you still have questions please read our Frequently Asked Question page here.